The SMS μScan System can calculate RMS surface roughness, reflectance and scattered light level (BRDF) on flat or curved surfaces under any lighting conditions. The portable system consists of a hand held control unit, an interchangeable measurement head and separate charging unit. To perform a measurement, the operator places the laser measurement head on the surface to be analysed and simply presses the button. Each measurement takes less than 5 seconds demonstrating how the SMS μScan System is excellent for quality control applications. The results are clearly displayed and stored in the system memory. The SMS μScan can store 700 measurements in 255 files and provides capability for pass/fail criteria. Optional PC software is available for control, analysis and file conversion and a calibrated mirror supplied to check results. 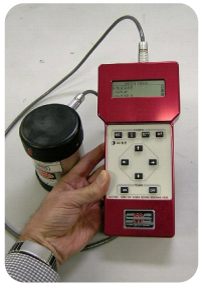 The SMS μScan System allows the operator to rapidly take measurements at the sample, where needed, in seconds. From a single measurement, a user can determine RMS surface roughness, reflectance and scattered light level (Bidirectional Reflectance Distribution Function & Bidirectional Scatter Distribution Function) on flat or curved surfaces under any lighting conditions. Applications include optical surfaces, telescopes, heliostat mirrors, semiconductor wafers, and precision machined surfaces and rolled or formed surfaces. Each Microscan measuring head has a laser diode light source (1), reflectance detector (2) and two scatter detectors inside (3 & 4) and creates a spot size on the target of 1mm diameter. 670nm, 900nm and 1300nm wavelength measuring heads are available each fitted with a spring loaded adjustment allowing convex surfaces of up to 114mm radius and concave surfaces of up to 508mm radius to be measured. Different wavelength heads can be interchanged with the Microscan Portable Controller.